How to Enter: Send me an e-mail telling about the best Mother's Day gift you ever gave (didn't have to be for your mother) or received. I'll post entries in future updates. 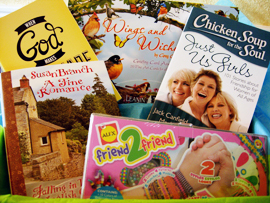 Box contains: A Fine Romance by Susan Branch, When God Makes Lemonade from Thomas Nelson, Pub., Friend to Friend Bracelet Kit by ALEX, Wings & Wishes greeting card assortment by Leanin Tree, and Chicken Soup for the Soul Just Us Girls! Hallmark founded Friendship Day in 1919. The U.S. Congress, by proclamation, in 1935 declared the first Sunday in August as National Friendship Day. Mark your calendar with these special dates. Send flowers- The yellow rose symbolizes joy and friendship and is named the official flower of Friendship Day. Invite a friend for a walk, share a picnic, or meet at a local coffee shop. May God grant you the treasure of a true and trusted friend. Select a spot in your yard and prepare the soil. When your friends divide plants in their yard ask them to give you some starts. If they have no flowers to share, give them ten or fifteen dollars and ask them to purchase a perennial for your friendship garden. They can also order online and have a plant sent to you. When your flowers are in the ground, pick up some plant stakes at your local garden center. Write your friend's name, the name of the plant, and the date you received their contribution on the label. Place each stake next to the corresponding plant. While weeding and caring for your garden, you'll spot your friends name and be reminded to pray for them. Flowers like friends sport certain personalities. Just for fun, as your garden takes shape, watch to see which friend gave you the quiet but colorful primrose, the bold bright lily, or the fragrant peony. Years ago at a ladies tea I listened to the guest speaker talk about friendship. She said there are two types of friends, ones whose actions say "here I am" and those who say "there you are." At the conclusion of her talk she said, "So which kind of friend are you?" I considered her words and realized when invited to a party or attending a church function, I only chatted with people I knew. Being shy, I waited for people to speak to me first and never ventured beyond my little group. Over the years, I've transformed from a "here I am" to a "there you are" kind of friend. It's scary to walk up to someone you don't know and introduce yourself. But today I take pleasure in meeting new people and hearing about their lives and what's important to them. By not letting fear stop me, I just might add someone new to my circle of treasured friends. How about you? No, it's not our four-legged furry companion, or even our spouse. Who then? It's Jesus! The one who promises to love us no matter what, to hear our every cry, and listen to the needs that tug at our heart. And don't forget Jesus provided each of us with the best gift we'll ever receive. A gift motivated by pure love from God's heart to you. Have you opened your gift yet? Jesus is waiting for you! Ruthie - I don't know that this is a secret, but one thing important in maintaining lasting friendship is not to be easily offended or hurt. Give grace, and believe the best about your friend, and you will both be blessed. Denise - The secret to long-lasting friendships is to realize not all friendships are for a lifetime. Some only last for a few years. People will naturally gravitate away from each other and it's okay. Others will last a lifetime, and those are the keepers. The ones you will grow old with even if you live many miles away. The ones you can pick up the phone once a year, but the conversation is like you've been apart for a day. Learn to know the difference, nurture the good ones, learn to let go of the passing ones, and always have room in your heart for new friends. Judy - My mother always told me the secret of having friends is to be a good friend. Now that my health isn't so good, I find it hard to get out and be with the people I love as much as I'd like. But when I spend time with my friends, it's as good as any medication, treatment, or massage. Cindy - I prayed for friends like I had in high school because I was experiencing loneliness a few years ago. Several months later I went to my high school reunion and reconnected with one of my best friends. We started having annual trips with our other best friend. We've shared many memorable times in the past and are by God's grace still close! We are there for each other and support each other when times are difficult. When my Daddy was murdered I depended on my friend's love like never before. She didn't let me down and has held my hand through dark times. I thank God for answering my prayer and bringing my old friends back into my life. I treasured their friendship and look forward to many new memories! Donna - One key to a lasting friendship is to just be there. We don't always know what to say or do, and if asked if something is needed, we are not always open, so just being there for each other is vital. Susan - It all goes back to the saying, "To have a friend, be a friend." That's what I've always done and have told my 3rd graders this for 30 years now. My late husband and I had a great friendship (Feb. 24th is his birthday) and we became friends first, before we became lovers. Through dating for over 3 years and being married for 25 years, everyone noticed how strong our friendship with each other was. We were each other's BEST friend. Our bond was stronger than super glue! Friends have to be there for each other and listen more than talk in certain situations. Friends find little ways to lift up each other. The best name you can call anyone is "friend." Kristin - I have made friends through a website called Amish Living. Over the past several years we have shared our thoughts, shared laughs, and joys and sorrows. We are bound together by our faith in the Lord, who brought us together for His purpose. These friends have lifted me up when I was down, shared many inside jokes with me, laughed with me, supported me when I needed it most, and allowed me to be their friend. Friendship grows with time~~like the seeds you plant in the garden. Over time, with proper care, love, and support, those flowers will grow into beautiful blooms (friendships).